Manistee Hospital is a wonderful place to welcome your new baby. The beautiful, eight-bed Maternal and Newborn Center includes three comfortable labor, delivery, recovery, and post-partum suites for a home-like birthing experience. The unit also includes private post-partum rooms. 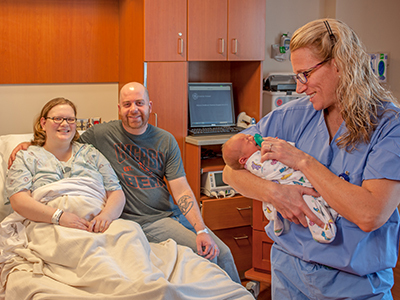 Rooms in Manistee Hospital’s Maternal and Newborn Center feature private bathing facilities, with whirlpool tubs in the birthing suites to provide comfort and convenience. Because of our size, your care is always personalized. You will receive our full attention as we collaborate with you on the safe delivery of your child. We will share your excitement and celebrate with you as you welcome a new member to your family. 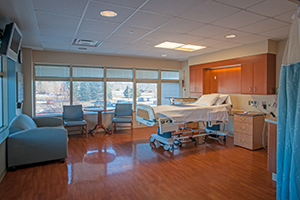 All patient rooms are large and provide space for family and visitors. The Maternal and Newborn Center also features other amenities for families, including a viewing nursery from the corridor, kitchenette, and enhanced security measures. The Maternal and Newborn Center is located on the third floor of the hospital, adjacent to the surgical unit, allowing for quicker access for surgical births and other urgent surgeries. The Maternal and Newborn Center has additional space for enhanced care of routine and unexpected birthing situations. The Family Birth Center provides a highly secure environment for infants. Confidential room assignments, video monitoring of exits, electronic security bands worn by all infants, and locked entrances to the unit help keep newborns safe. Our Level 1 nursery attends to the needs of healthy infants and identifies and transfers any ill or premature infant who needs a higher level of intensive care. A certified lactation consultant is available, along with knowledgeable nursing staff, to assist you with breastfeeding your baby. For more information, call the Maternal and Newborn Center at 231-398-1122. We encourage you take our “Preparation for Labor and Delivery” class during your fifth month of pregnancy. To learn more or to register, call 231-398-1414 or 800-968-9292, ext. 81414, or click here to register online.